Port Dover Ontario is a town of about 6,000 with an economy based on the local fishing fleet and a strong tourism base. It is a picturesque community where the focus is on its waterfront. It is situated on the north coast of Long Point Bay and its deep harbour offers good protection when the prevailing westerly winds begin to kick up. It has terrific beaches, great restaurants and pubs as well as lots of interesting shops to browse through. 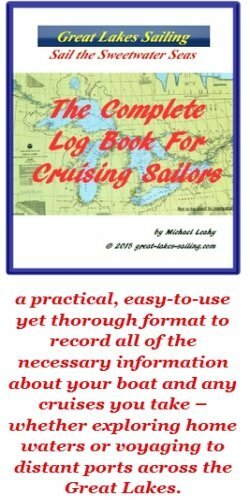 There are 2 particular hazards that a cruising sailor should be aware of when approaching Port Dover Ontario. The first is Nanticoke Shoal. This shoal is located at LAT 43o 44.397' LONG 080o 4.369', approximately 6.5 nm SE of Port Dover. Its SE limit is marked with a Fl RED light (EA8) and its NW limit by a Q Fl RED light (EN2). This is a large and dangerous shoal. Keep well to the west of these marker buoys. The second hazard is actually 2 - they are obstructions located immediately to the east of the approach to Port Dover channel. The outer one is marked by a Fl RED light (ED2) Stay to the west of this buoy. Once you have passed buoy ED2, you can turn and make your course into Port Dover Ontario. Depending where you made that turn, your course line will be approximately 000o for about 1.1 nm. A good daymark is the Port Dover water tower situated on the east side of the harbour. It is not charted but easily visible from offshore. There are 2 harbours in Port Dover - the original harbour at the mouth of the Lynn River and a much newer harbour, Port Dover Harbour Marina, designed for recreational boaters. The entrance to the original harbour is marked with ISO GREEN and RED lights on the ends of the port and starboard breakwaters, respectively. As you clear the entrance, you will see on your starboard side a turning basin. There may be some transient slips in the basin. There may also be some berths along the western seawall. Most sailors will continue up the river though to either the Port Dover Yacht Club or the Long Point Bay Yacht Club. To reach these, you have to pass the highway lift bridge. The opening signal to give is 3 blasts on the horm. The entrance to the municipal marina is .25 nm due east of the entrance channel to Port Dover Ontario. It is marked with a Fl RED light. This is the main recreational harbour. Owned by the municipality, it has 455 slips with 15 available for transient sailors. There is a fuel dock (diesel and gasoline) and a pump-out station. Although there are no repair or maintenance facilities in this marina, there is a mechanic on duty during normal business hours. There is water and power to each slip. There are washrooms (public) and showers. available. There is a pavillion and picnic areas as well as BBQ grills. They have a haul out facility. Internet service is available. Bridge Marine is located up the river, north of the lift bridge. They have a couple of slips available for transients. They provide a full range or repair and maintenance services for engines, electronics and fiberglass/hull repairs. They have a chandlery with a very good selection of boating supplies. Located north of the lift bridge, Matthews Marine carries out engine and boat repairs and maintenance. They have a haul out facility. PDYC has several transient slips available on a reciprocal basis. They have water and power at the slips. There are washrooms and showers in the clubhouse as well as a club bar. LPBSC is located at Port Dover Harbour Marina. This small club has about 60 members. There may be slips available for transient sailors. As a footnote, this is the first yacht club I ever belonged to, joining after I purchased my sailboat many years ago. At that time, the club was located at Boothes Harbour at the head of Long Point Bay - great memories. Bridge Marine can carry out a full range of repair and maintenance services (see above). Port Dover Harbour Marina has a mechanic on duty who can provide maitenance and serive work on engines and mechanical systems (see above). There is a < b> grocery store located north of the marina that can meet all of your provisioning requirements. You would need to take a taxi to get there. There are three banks in the downtown, all with ATM machines. The nearest hospitals are located in Simcoe, ON (Norfolk General Hospital 519-426-0750) about 10 mi/16 km NW and Hagersville, ON (West Haldimand General Hospital 905-768-3311) about 14 mi/23 km NE. There are 2 pharmacies in Port Dover Ontario. Dover Apothecary (519-583-3784) is the closest to the harbour. Port Dover Ontario has become one of the most popular stopovers for cruising sailors on the north coast of Lake Erie. One reason for this is the variety of really good restaurants and pubs. There is something for everyone's taste and for all ages. Here are a few of the more popular ones. Callahan's Beach House Restaurant is one of my favourites. Located a block from the harbour and right on the beach, it has a great balcony with terrifc views of the lake. I have to confess that I have enjoyed watching (from a comfortable table behind glass) a very angry Lake Erie pound the shoreline and harbour entrance as much as I have enjoyed those idylic sun-drenched summer days. Callahan's serves good food from a varied menu. The service is good and its a popular place. And along what other beaches on the Great Lakes can you find palm trees growing??? The Dover Dairy Bar is another well-known Port Dover favourite. Although it does serve other fast food staples, most come here for the ice cream - and its worth it. Erie Beach Hotel is a 60-year old establishment that is a fixture in the community. It is located a block from the harbour and the beach. This 3rd generation family business is famous for its Lake Erie perch and pickerel dinners. They can be enjoyed in either the pub-style Terrace Room or in the Cove Room, a more formal dining room. Knecktel Foods is located downtown, by the beach. It specializes in Lake Erie perch and known for its quality and prices. During the summer months, this lakeside community hums with activity, especially on the weekends. A natural attraction is the beautiful public beach. On the weekends, come early! The Lighthouse Theatre is a well-regarded performance venue with productions running all summer. Powell Park, in the downtown, is the scene of popular summer concerts. The Port Dover Harbour Museum is a highly-regarded maritime museum. Its exhibits and galleries spotlight life on the Great Lakes, the fishing industry, Long Point and its role in shaping local life and the rum-running adventures of years gone by. It is definitely worth visiting. One event that it hosts is an annual heritage weekend with tall ships and reenactments of actions from the War of 1812. A visit to Port Dover Ontario would not be complete for a sailor without a visit to the Fishermans Memorial located on the harbour seawall. This poignant sculpture commemorates the loss of 28 fishermen from Port Dover over the years. Throughout the summer, there are many festivals and events including a popular corvette auto show, flower show, fish frys and a very large Canada Day celebration. A quick look at this Port Dover Ontario tourism site will give you many ideas on getting the most of your visit.